Don't you just hate it when work gets in the way of your extra-curricular activities? That is the fate that I've been battling for the past week or so. Work work work, with little time for blogging. But the deadline has gone, the load has lightened and I'm back to blogging with a bang! Now I'm not a big pasta person. Sure I like it (of that there's plenty evidence on this blog), but I generally only make it about once every two weeks or so. Mostly because it's a quick, easy & satisfying meal. And it generally pleases all palates. Not necessarily because I can't get enough of the pasta taste. But dear readers, I have come to my senses. Or more accurately, homemade pasta has brought me to my knees. To call this by the same name as the mass produced noodles that masquerade as the real thing, should be classified as an offense. For this is in another category all together. It is soft and chewy all at the same time, with an amazing mouthfeel. The texture is something I cannot describe to you, except to say that it's satisfyingly filling and almost "meaty". Without being dense in any way. If that makes any sense. I fear sense has left me upon meeting with the real thing though... Currently my thoughts are consumed with only one question: "Please sir, can I have some more?" 1. Combine eggs, flour, oil, herbs and salt with just enough water to allow everything to come together in a ball. Gently knead until the dough is smooth and elastic, adding extra water or flour if necessary. 2. Cover with clingfilm and let rest for 20 - 30 minutes. Divide dough into four roughly equal pieces, then roll each piece out very thinly using a rolling pin. Cut into long ribbons using a pizza cutter. (Alternatively use a pasta machine). 3. 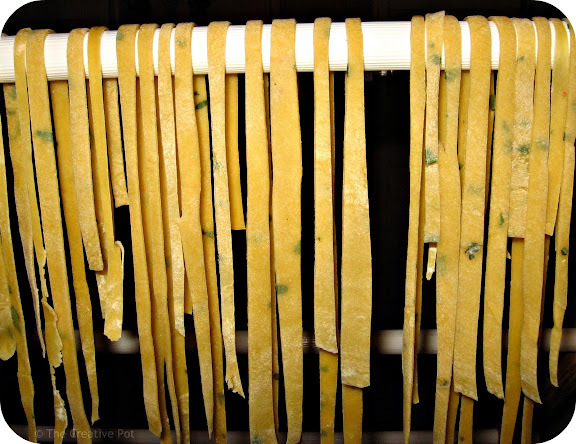 Hang noodles up to dry slightly (5 - 10 minutes), then cook as you normally would, bearing in mind the fresh pasta will only take about 6 minutes to cook. Alternatively, dry longer until crisp, then remove and keep in airtight containers. 7 Jan - Mmmm, when I started adding pesto (coriander or the usual basil) to my tuna salads and sandwiches, it was as if a new window on the world opened for me!! So tasty. And well done you on the exercise - mine is stil confined to the odd rowing session on our water rower at home, or taking the stairs to my office on the 6th floor twice a day! 10 Jan - That was a fun jog down memory lane! I definitley want to give the chai latte cupcakes a whirl... All the best for 2010! 12 Jan - My husband is usually ready to gnaw off his own hand by the time i have the food plated and photographed and ready to go ;-) The dish sounds great, even with the cautionary tale about exploding eggs! Thanks for the heads-up - will investigate the commenting malfunction (assuming it's a blogspot glitch, as I haven't changed any settings). And thanks for all the lovely comments - you guys really make my day!